Oud Oil Ittar Albakhur Parfum 6ml, a superior oud wood extracts of the finest oud for both men and women. 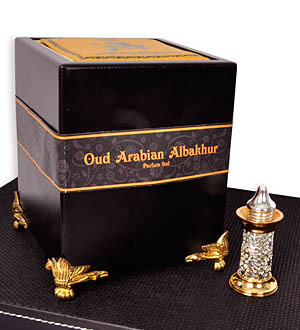 A soulful aroma with the originality of Albakhur blend. Alcohol-free. Learn more about the Giving of Oud and the many benefits of Oud oils and parfums. Next day delivery applies for order made before 12pm on a working day. For outstation delivery within Malaysia, at least 3 working days notice required. Call Giftlab at 03-78830233 / +6012-6915200 or email us at sales@gift-lab.com for assistance.